Nothing embodies mountain living in Estes Park more than hardwood flooring! Hardwood flooring comes in a variety of species, sizes, textures, and colors. Hardwood flooring is one of the top improvements you can make to add immediate value to your home. 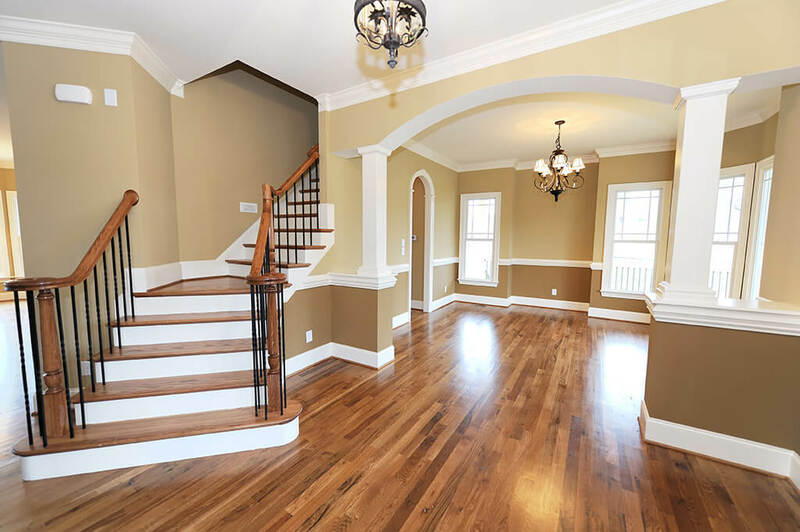 Our team will help you pick out the best hardwood floor based on your preferences, the construction of your home, budget and vision for your ideal hardwoods. Call us today to set up a free in-home consultation. At our local Estes Park showroom we have hundreds of different hardwood flooring options for you to see, touch and feel. When selecting a hardwood floor there are two main options: site sand and finished or prefinished. Site sand and finished hardwood flooring is made of solid hardwood. With this type of hardwood flooring you will select the species of wood, character grade, plank width, sealer/stain color and the finish sheen. Once all the selections are made, we install the raw hardwood and complete the sanding/sealing/finishing process at your home. This type of hardwood will give you a smooth consistent final look that can be repaired or refinished as needed for years to come. Prefinished means that the hardwoods will have the stain, texturing, and finish already applied to the hardwood when you purchase the floor. Prefinished hardwoods come in numerous different species, sizes, styles, colors, grades and texture options. Given that all the work to finish the floor is completed by the hardwood manufacture, this type of hardwood installs much faster than site sand and finished options and usually does not require any dry time after installation. Prefinished hardwoods add additional flexibility by coming in two different options: solid prefinished and engineered prefinished. Solid prefinished hardwoods are solid wood throughout the entire floor. One key difference between prefinished and site sand and finished floors is the edge between each board. With any prefinished product you will have a beveled edge between each board. This gives prefinished hardwoods a unique look. Engineered prefinished hardwoods have a top wear layer that is made of hardwood. The only difference is the engineered product’s core. Engineered cores are made of varying layers of plywood or composite materials. This type of flooring can be installed on in-floor heat systems and over concrete. Depending on the product and style you are looking for, engineered products can also be much more cost effective. All hardwoods and job sites are different. Give us a call and we can help you navigate all the different variables that go into creating the best hardwood floor for your home.